Prepare for a long post! 🙂 The end of November brought the Harvest Festival and Fishing Tourney, a WiFi with a new friend, the end of a castle’s home loan, lots of redecorating and gardening, the scenery of late Fall, and Citàlune’s first snow. Just thought this was a cute outfit. I WiFied for the first time with someone I’ve been in contact with for a while, Lilli (Virtus from Sidus in-game)! 🙂 She started an AC blog, so feel free to check it out! Ahh cool, she has Carmen! 🙂 Not my Carmen, though, of course. Haha 😆 It’s too bad the sky was so cloudy, and the lighting so dull! She really wanted to meet Biskit, so we went on a hunt for him and found him in the Emporium browsing the music albums. It’s always kinda sweet for me to see someone who really loves a villager that isn’t uber-popular. ^^ All the villagers deserve some love and fans! 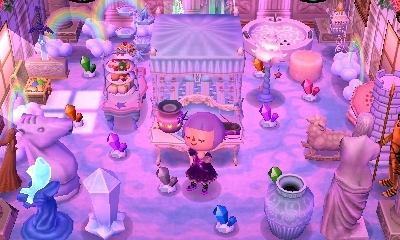 I tried out roses instead of lilies and violets around my fountain (with the same color pattern as before), but strangely didn’t like it as much! So I changed it back to the lilies and violets. Haha, having Lyle at the doorstep felt like old times in Wild World, when he’d hang around your house on Saturday mornings. But he’s not here for insurance sales, he’s here to give me information about the HHA Theme Challenge, which is available to those who expand their houses completely and pay off all their debt. The challenge involves both evalulations on the exterior house and on how well the entire house (all the rooms and the exterior together) matches a certain theme of your choice. I went with the Fairy Tale theme challenge, of course! Sitting under the tree in the snow, which has now lost all its leaves. But we got all the dishes done in the end! 🙂 From left to right, they are: a mixed salad, fruit soup, sautéed sea bass, and cherry pie. Overall it was a cute, fun event — especially at first! But it got a little frustrating towards the end to get the last few ingredients, and because my neighbors kept requesting barbel steeds (they seemed hard to find for me). And I’m very glad to have some more food items for Estel’s dining hall: a fruit basket and a cornucopia! 😀 I also made sure to collect some of the ingredients like milk, butter, sugar, and especially lots of vinegar. No, I’m not going to leave the vinegar on the floor of Estel’s dining hall like this. xP I have plans to use it for Fern’s house in the future! I want her house to have an old inn/tavern feel to it (Fern’s Tavern? 😛 ), and I think having some of these bottles scattered on cabin tables or something will help add to the feel I want. I put some milk, butter, and sugar together with pumpkin pie on Violet’s kitchen table — ahh, sounds yummy! I changed it to something a little more cozy and cottage-like. But I’ll probably continue messing around changing her house for a while to come, so this isn’t necessarily permanent. But the golden roof is the only one I’m interested in, so I just put an order in for that. Lyra also got a gold badge from Phineas, and a golden house model and gold trophy in the mail, for her efforts in impressing the HHA. I’m really happy with how the gold roof turned out! It’s not yellow anymore, but legit gold! Future changes: If possible, in the future I’d like to replace the sapphire furniture with pieces from the golden series instead (golden tables and a golden bench). What it is: A throne room, with many stained glass windows, stained glass lamps, and jewel furniture. Future changes: Might one day want to replace the gold and silver modern chairs with actual thrones. Also might continue contemplating the wallpaper/flooring, but I think the mosaic wall & tile is the best option there is, to be honest. What it is: A music hall with mostly classical instruments (didn’t want to put stuff like metal guitars in here). What it is: A performance hall for theater, dance, etc. For this stage set-up, I had A Midsummer’s Night Dream in mind, haha. What it is: Lyra’s bedroom, which is appropriately filled with gold and luxurious items. Future changes: Might add some odd knick-knacks here and there as I collect them, I dunno. I felt a little unoriginal doing this since I’ve seen quite a few people with chapel-style rooms, but obviously it’s a very beautiful sort of room to have, so it appeals to many people. 🙂 And I think that my furniture, carpet, and wallpaper choices were still my own and not based off others’. I’ve worked on improving the entrance and flower arrangements in front of Lyra’s castle (to better match the sun theme), but can’t finish it until Biskit’s house is gone. …Which might be soon, actually! Is anyone interested in having Biskit, by the way? (Lilli?) It’s okay if no one is, I’ll just put him up on AC:NL Adopt as usual. ^_^ Biskit’s been taken now! Posted on January 3, 2014 by Amy •	This entry was posted in AC:NL, AC:NL WiFi, Citalune and tagged Animal Crossing. Bookmark the permalink. Uh wow.. you sure are doing good in ac! I cant comment on your last comment because my computer was messing up..
Thats ok! Thank you. I don’t need the gold roses anymore, because I found the duplication glitch. Well.. I feel sort of rude asking, but.. here it goes.. I have searched EVERYWHERE and I can’t get a ice vanity.. I know your country got a different New Years gift to mine, so would you like a tweeter or a pile of leaves or a shaved ice lamp for one? Sunday, at 8, 9 10 or 11 am. Btw, what town are we meeting up in? Okay! Mine is too (replanting trees right now), so please excuse the mess! Is it getting around time for us to WiFi now? Because I know you’re probably 5 or 6 hours ahead. thanks for wifing with me 🙂 you have a very nice town! I have to say that I really love Violets house! I love all of your houses, you worked so hard on everything and I really like it that you take the game so seriously. 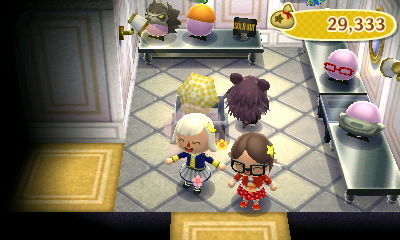 The ballett room is so cute. Is she dancing Tchaikovsky’s “Swan Lake”? Those items would look so cute together in a bakery or a kitchen, with some birthday cakes or something nearby! ^_^ I agree, and I’m really impressed by the holidays in New Leaf in general! A lot of these holidays were in the GameCube version and City Folk as well, but they weren’t as detailed back then. In the Harvest Festival for AC:GC, for example, all you had to do was fetch from silverware from the table for Franklin (to protect him from being eaten). Getting to help cook a feast is just so much more involved and interesting than that! Aww, thank you very much, I appreciate the kind words! x3 I’m glad you like the rooms! 🙂 Swan Lake and other ballets crossed my mind, but I figured the play A Midsummer Night’s Dream would be fitting since a lot of it takes place in the woods (represented in the room by all the tree standees). On a sleepless night a few month back I was reading your GC entries and I was surpries how similiar the festivals are. My favourite things from the GC version are now in New Leaf, like the little iglo in the wintertime, it’s supercute! Ahhh that room sounds adorable! x3 It’s too bad the wedding cake seems to be un-orderable, but I’m sure they pop up at the Emporium every now and then. is it really true you can make a cake from milk, butter, flour and sugar!? Wow I should try it! oh.. Lol. Still, it’d be fun if that really was real. AAAAAHHHH, Lyra’s house is beautiful! It’s always so great to have finally completed a character’s house 😀 I can’t wait to see Citàlune in the Dream Suite now! Estel looks gorgeous as always 🙂 I really like her new hairstyle! It goes really well with her GracieGrace dress! Thank you! 😀 I don’t think her house is 100% finished, but the basic layout of rooms I’d like to have is finished, and I can gradually improve the rooms over time. 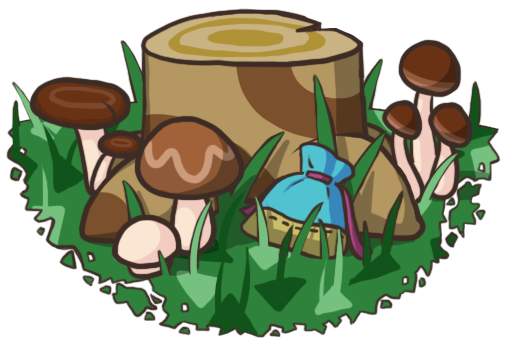 🙂 Ahh, and I’m sorry, my dream hasn’t been updated since the gold trees update >_< I don't really like the color of the grass and trees right now, so I was planning to not update until snow covers the ground (I think I remember you did the same :P). I consider the long white hairstyle with the side-swept bangs Estel's default hair, but don't mind playing with new looks every now and then ^_^ I'm glad you liked it! 🙂 And thank you for the feedback about the tiles! Just wanted to say THANK YOU SO MUCH for introducing to me the prospect of trading on TBT (because the thought hadn’t occurred to me before lol xD). I know what you mean now when you say that it’s totally worth it — just made a trade of epic proportions tonight when I pawned my complete golden cabana set for 2 million Bells, a twelve-grape plate, berliner, and New Year’s noodles! Ah cool, you’re welcome! Wowww, that trade does sound epic! I’ve been wanting some of those region-exclusive food-related DLC too! I figure I’d better save up some more bells before I try to do a trade for them, though. Congratulations on getting those awesome items 😀 There are also trading opportunities at ACC if you’re interested in having another AC site and pool of users to trade with (maybe you’re already there!). Thanks! ^_^ Woww you can really make all that off selling ice furni? 😮 I’ve already got some extras of the ice set in my second NL town, so I’ll definitely consider selling that stuff…though I always have trouble selling non-orderables, I’m such a pack-rat! It’s a bummer the holly berries can’t be seen at all underneath the snow! You can still see some of the holly-shaped leaves, so it wouldn’t have hurt to add a few red berries here and there, would it? Oh, all of the bushes in Estel’s garden are holly! I picked it because it seemed like a nice “neutral” bush to have year-round. I kind of wanted the bushes to give off a hedge feeling, not necessarily be super flowery and colorful year-round. But maybe when the hydrangeas are in bloom I could try out blue ones, that might look nice! You have done a wonderful job designing your town! I find the layout very inspiring. I need to get back into AC:NL. I hope that no one has moved. How do you have so much money! ?